Triumph lore has it that Turner cribbed the design of the Speed Twin's engine from that of the Riley Nine automobile, an example of which he owned. 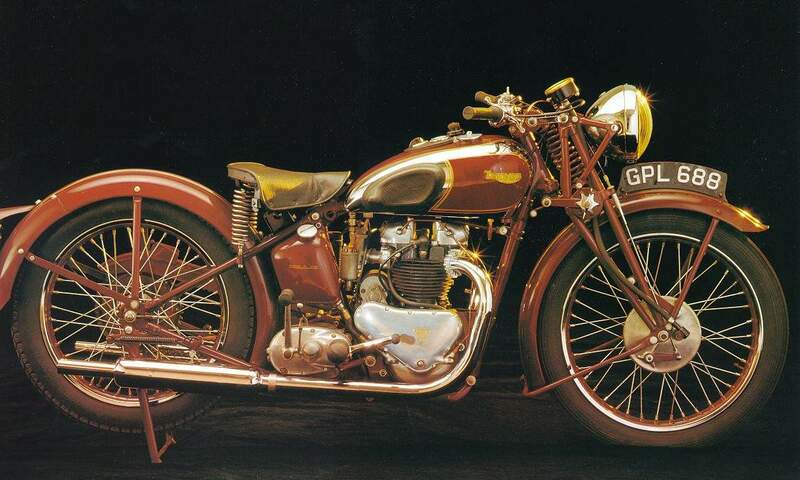 Wherever the design came from, the Triumph appeared with a 63mm bore and 80mm stroke yielding 498cc of displacement. Its cylinder head was cast iron, and its compression ratio was 7:1. It breathed through a single Amal carb with a minuscule throat opening. Ah, but the engine was smooth, and it produced 28 horsepower-four more than a Single of comparable size. Depending upon which road test you read, and upon how much tailwind assistance the bike received, this first Speed Twin was capable of between 94 and 107 miles per hour. Average fuel consumption of 65 mpg was claimed. These figures satisfied an enthusiastic public. The Speed Twin prospered, and production of bikes carrying that model name continued through 1966. In all, nearly 45,000 examples were built, helping to establish Triumph as the world's most prestigious motorcycle manufacturer.